Here’s [[The Truth]] from Plymouth Pavilions – amazing! “Squeeze, the enduring British pop act whose songs have tenderly and wittily chronicled life and love stretching across four decades, are to play an extensive UK tour in the autumn – their first, as a band, for three years. As well as a vast catalogue including hits such as Cools For Cats, Up The Junction and Tempted, it will include songs from forthcoming album From The Cradle To The Grave, which marks their first collection of new tracks since 1998. Squeeze have long been a captivating live act with an array of chart hits – which also includes the likes of Take Me I’m Yours, Slap And Tickle and Pulling Mussels (From The Shell) – but for this tour there is a further treat with new tracks which will appear on From The Cradle To The Grave. 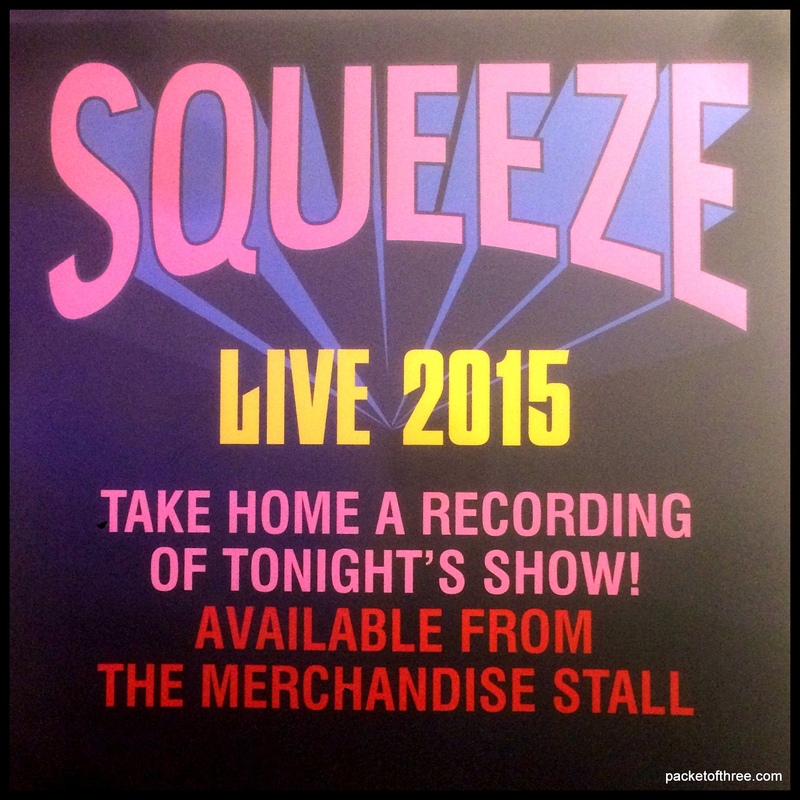 2 Responses to "Squeeze – 25 September 2015 – live at Plymouth Pavilions"
Having already been put in a very good mood indeed by the legendary Dr John Cooper Clarke, who was just hilarious from start to finish, Squeeze enter stage right Glenn Tilbrook already stabbing out a riff on his guitar as though he can’t wait to get cracking. Before we know what’s happening they’ve jet-propelled into Hourglass and what follows is ninety minutes or so of pure bliss. 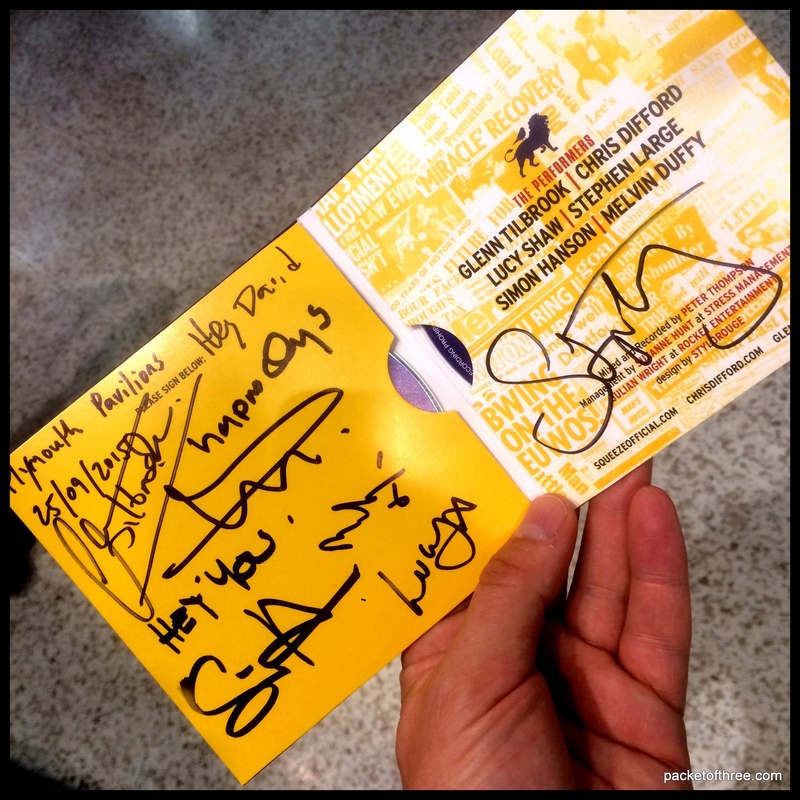 This was like a dream where you find yourself at a gig and a living legend comes on as the support act (and is as good as you hoped) and is then followed by your very favourite band as the main act – also living legends – who are even better than you expected. How to pick out magic moments from so many? They play the hits that were never really hits of course, interspersed with tracks from their cracking new album and really gigs do not get any better than this. Glenn has a little trouble with his guitar here and there – “You may have seen me looking a bit confused – my guitar sound sounds more like Angus Young’s guitar sound than my guitar sound” he says – but it’s soon sorted and on they go, undaunted that Plymouth Pavilions is inexplicably only two thirds full – didn’t everyone get the memo that the best band in the world was in town? After a very groovy new song called Nirvana (introduced as their tribute to Hot Chocolate!) the band slip away into the shadows and a single spotlight picks out Glenn sitting alone at an electric piano. He holds us spellbound as he starts to sing “Today is none of our concern…” and we’re reminded what a truly great singer he is – and I use the word great in it’s proper meaning of a-bloody-mazing. His voice is both tender and tough at the same time (how does he do that?) so strong and full of expression – unique and unmistakeable. He sounds like no one else and, for me, he’s one of the best singers of the past forty, fifty years – maybe the very best. Which makes the humility one senses on meeting him all the more admirable. The band reassemble for an equally spine-tingling rendition of another of the new songs – Everything – surely an instant classic and then, having turned us into mush, the end of this beautiful melody slowly morphs into a wonderfully skewed opening of Labelled With Love. This is followed by a souped-up Cajun version of Slap and Tickle – another highlight in a show full of highlights. Other semi-acoustic versions of Squeeze’s gob-smacking back catalogue follow and I think to myself, surely there’s a strong case to be made for Chris and Glenn to take the band into the studio to record all these wonderful acoustic versions of their classics – an acoustic sequel to Spot the Difference – to have on record how these songs have matured with repeated performance over the years, how they’ve grown up, left home and come back years later, changed and different. The band is tight throughout and even when they rock out there’s no loss of subtlety. Lucy Shaw has slotted in with the ease you would expect alongside her fellow Fluffers and has a quiet air of effortless cool and glamour. Melvin Duffy, drafted in for the tour to play slide guitar and mandolin, gives the band extra depth and dimension. What else is there to say? How great it was to see Chris enjoying himself, how great a drummer Simon Hanson is, how brilliant a keyboard player Stephen Large is. What else? Just this – if you get the chance, catch this tour, because this legendary band is playing at the top of their game – they’re as good, no, better now than in their days of chart success.